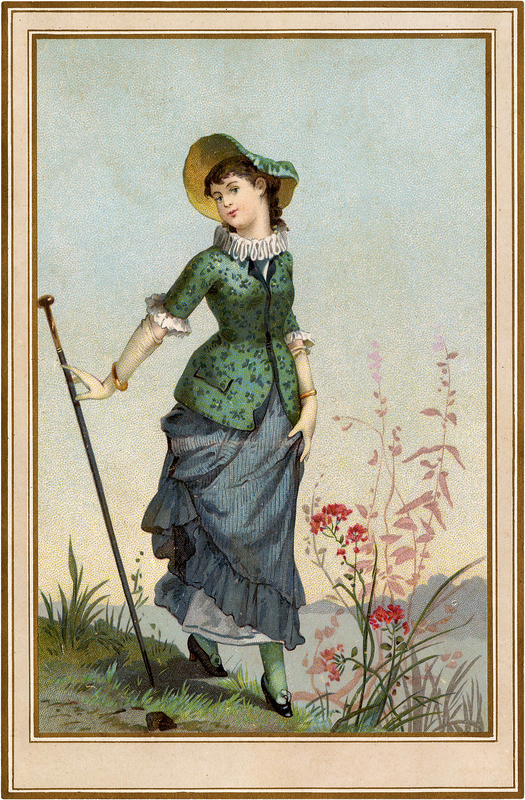 Lovely Vintage French Maiden Walking Image! Today I’m sharing this Vintage French Maiden with a Tall Walking Stick Image! In this beautiful landscape image, a coy, smartly dressed French woman strolls in flowers beside a lake holding a tall, elegant walking stick. She wears a green floral print jacket with a high ruffled white collar over a blue skirt that is pinned up to reveal her petticoat over green tights and tiny pumps. Her hair is covered by a large brimmed hat. So nice to use in your Craft or Collage Projects! Vintage Photo Woman With Arms Crossed Image! Vintage Sewing Mannequin Graphic! Old Photo Woman in Wide Brim Hat Postcard Image!